Day 2 of Vegan Mofo. 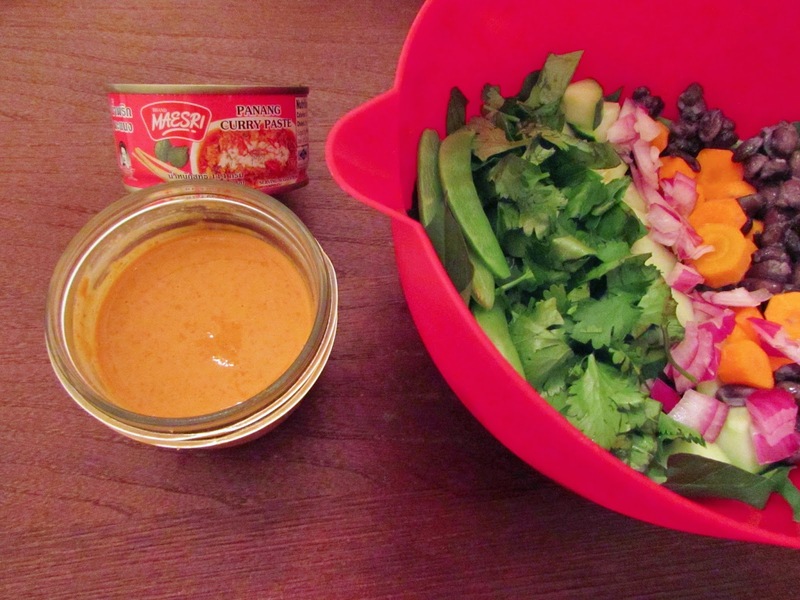 On the menu is this Thai Curry Salad. This salad is really, like many of my greats, easily adjustable to the current contents of your fridge. The only essential ingredients are the Thai curry paste and cilantro (which can be easily subbed for mint if you are not a fan). 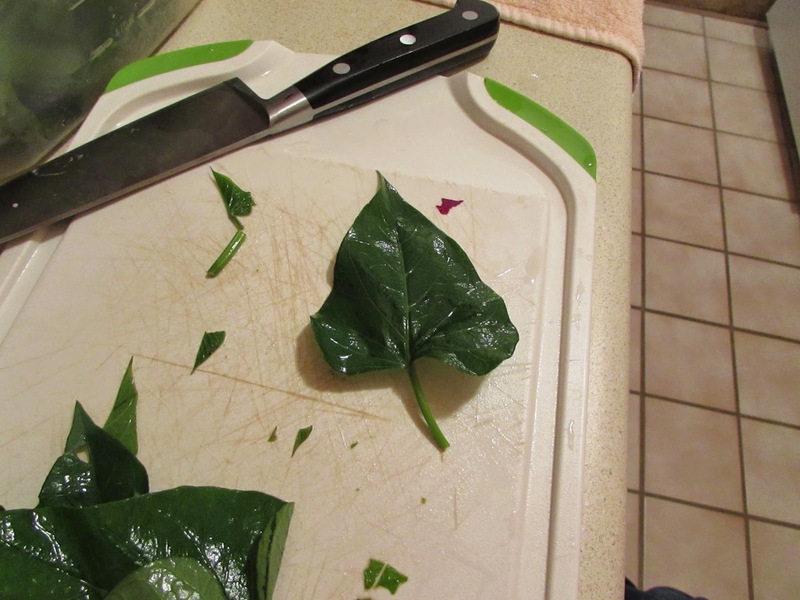 I was wandering around my local farmer’s market and found these interesting sweet potato leaves that I thought I would try out for this salad. The kind vendor told me they were very similar to spinach and could be used in the same manners. After actually trying them, I’d say he is somewhat right. They tasted mildly like sweet potatoes, somewhat starchy, and less bitter than spinach. This is because they lack the oxalic acid spinach contains. They have a beautiful shape, too. 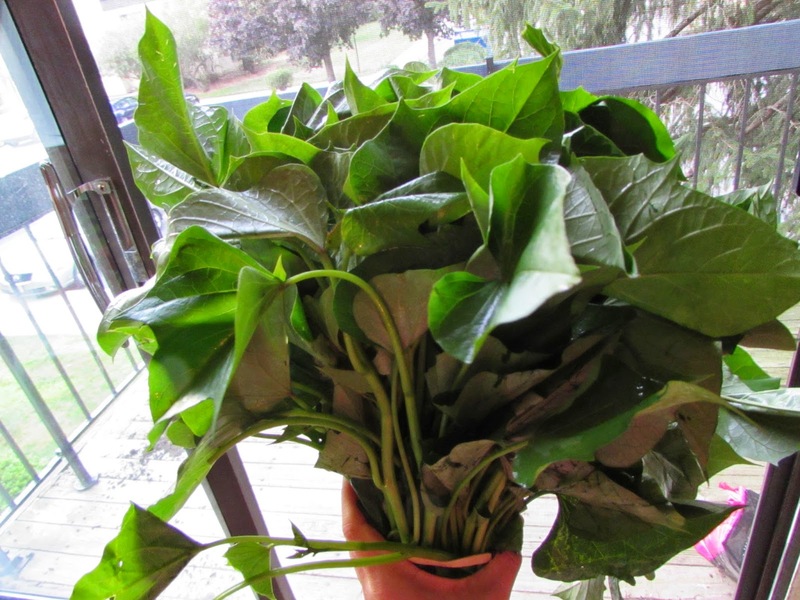 Sweet potato leaves are traditionally used in Asian and African cooking. Like many other greens, they are high in Vitamin K and Vitamin A. Besides making this salad, I also sauteed them with some olive oil, and have to say that I didn’t really enjoy their somewhat gelatinous texture. Personally, I’ll be sticking to consuming them raw. This salad is an easy one to prep for your weekday lunches. I made two at a time here, but you can make five a time if that is your fancy. I just chopped all of the veggies at once and portioned them out into each of the bowls. And it will fill you up for your afternoon ahead, due to the protein from the black beans and healthy fats in the thai peanut dressing (note that one bowl is missing black beans in the pic above as I ran out that night). If you are looking to shake up your lunch rotation, give this salad a try! 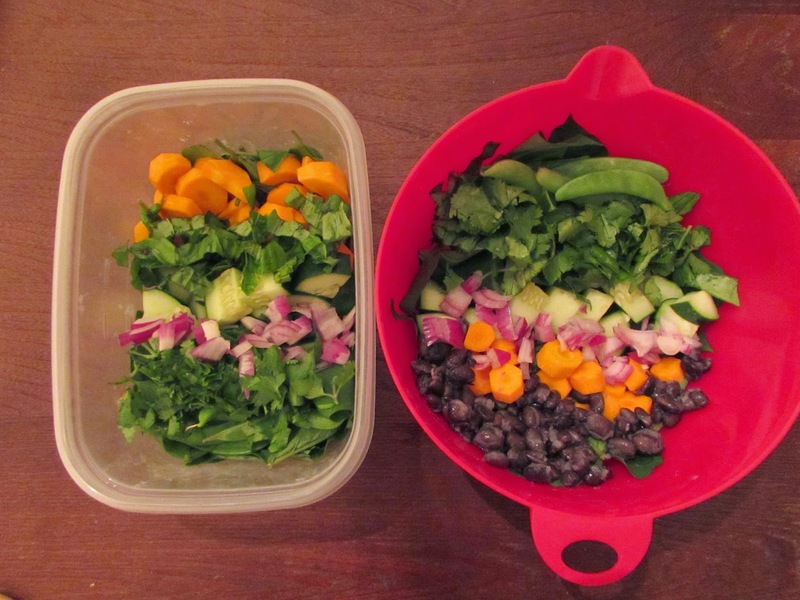 Add all salad ingredients to your container or bowl. Mix dressing ingredients until blended. When ready to serve, dress salad and be in Thai curry heaven. Note: Make sure to check that your Thai curry paste is vegan. Some will have fish products. I used the Maesri brand Panang Curry can pictured in the first picture, which I picked up for $1 from my local Asian grocery store.